Our 64 kombatants have been revealed. Now, it's time to find out who you'll be going against in Round 1. 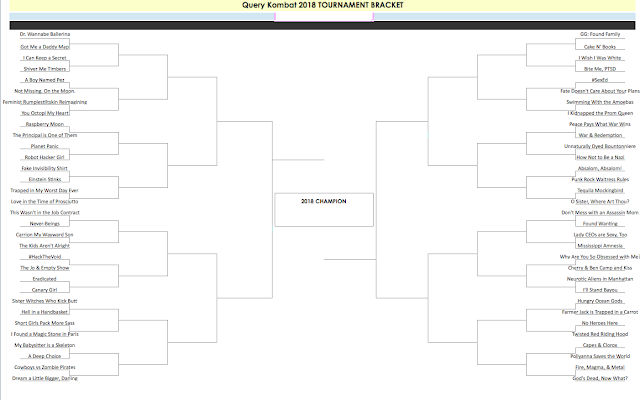 Use the #QueryKombat hashtag to find your opponent on Twitter. Trash-talk is okay, just keep it friendly! Quick reminder: The first round one kicks off at 8am on June 1st. It'll be hosted across all three blogs! Visit this post for commenting guidelines. Winners and host saves will be allowed to revise before the agent round. We suggest you get an early start on the changes you want to make because you won't have much time. Fire, Magma, & Metal vs God's Dead, Now What? Punk Rock Waitress Rules vs Absalom, Absalom! Tequila Mockingbird vs O Sister, Where Art Thou? Query Kombat Sub Day 2018!